Read Our Review And Trade over 2000 instruments with Nadex! Regulatory controls mean that Nadex is unable to offer bonuses, rendering this particular ratings area non-applicable. The trading platform’s software is the most professional on the retail-facing binary options market and offers traders significantly more control and options than most other competitors. The mobile app version of the trading platform is cutting edge and the score is only slightly let down by the old-fashioned look to the desktop browser-based version of the platform. Customer support meets regulatory requirements and is to the expected high level though only currently available in English despite the exchange being available to residents of a wide range of countries around the world. Finally, with over 2000 tradable instruments available via Nadex’s platform, DMA-pricing on quotes and a professional-level range of binary options set-up choices and in-trade control, the options choice is unparalleled, reflected in the high score here. Binary options have long been one of the forms of financial derivative, or instrument traded by professionals. Their simple structure, where the option finishes in the money if the holder correctly predicts the price direction up or down, and the fact that the potential profit or loss is fixed from the beginning, gives them a unique character as a tradable derivative. They are used both as a hedging mechanism against CFD or other derivative positions or as a stand-alone derivative to be traded in pro-circles. 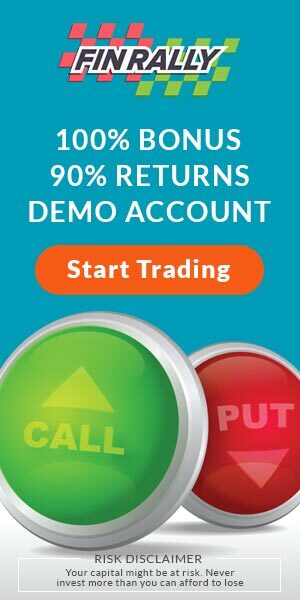 Over the past several years, the uniquely simple nature of binary options has seen them boom in popularity among retail traders. The fact that they do not involve leverage, so losses are never greater than the initial investment, and that traders need only be right in the binary sense of the underlying asset’s market price rising or falling, with by how much not important, has proved very appealing. Beginner traders intimidated by the seeming complexity of CFDs trading and spread betting see binary options as a more accessible alternative to trading the financial markets. These qualities also appeal to many more experienced traders who continue trading binary options either exclusively or in combination with CFDs or spread betting. The rise in popularity of binary options trading with retail traders has also seen an explosion in the number of binary options brokers. Many have further simplified the instrument further for the retail market and stripped out options to change the binary option mid-trade, leaving a pure ‘up or down by x time’ choice for traders. A very few offer essentially the same binary options derivative the professionals trade. Different brokers also have other variations in the product and service they offer such as their trading platform, range of available tradable assets, minimum and maximum investment stakes per binary option and so on. In our review section, we cover the main qualities of a large number of different brokers in order to make the research process of traders looking for the right choice of broker for their requirements a little easier. In this review, we look at Nadex, the only binary options exchange regulated and based in the U.S.
Nadex (North American Derivatives Exchange), formerly branded as HedgeStreet, is regulated in the U.S. by the Commodity Futures Trading Commission as a financial derivatives exchange. The company is the U.S. unit of FTSE 250 company IG Group, the UK’s largest retail-facing exchange of financial derivatives. However, Nadex does not exclusively work with U.S. citizens and residents of a long list of countries from around the world are able to open a trading account with the exchange. Market makers set pricing quotes themselves (in theory these should closely track the price of the underlying market though in practice there can be greater divergence than traders would expect) and take the other side of the trade. This means when a trader using a market maker’s platform wins a trade, the market maker loses money and when they lose the market maker makes money. Again, in theory, a market maker should be hedging positions and objective as to whether its traders win or lose but the practical reality is that traders often consider there to be more theoretical potential for a conflict of interests than ideal. DMA exchanges are exchanges in the true sense. They operate an exchange, matching long and short positions with parties in the wider financial market willing to take the other side of the trading position. The exchange’s revenue model is a commission on the entry and exit of the trade, for facilitating the match. DMA exchanges are 100% objective as to the outcome of the position in terms of their revenue model as they make the same commission regardless of if the trader finishes in our out of the money. If anything, if they did have a preference it would be in favour of their traders as they more they win the more they will trade. As such, Nadex is incentivised to provide a trading environment that gives binary options traders using the platform the best possible chance of success. Nadex’s trading platform looks a lot more like a professional trading platform than is standard for binary options brokers. This has its positives and negatives. While binary options, even the pro-form offered to the retail market that Nadex exchanges, are very simple derivatives, the greater control than most retail-facing binary options brokers offer to traders, necessitates that the trading platform is more complex. Nonetheless, the software is well designed and traders with at least basic computer literacy will quickly get to grips with it. It does look a little more old fashioned than ideal from a design point of view. Again, this is because it is based on platforms of the kind professional binary options traders use, which are ironically more dated as they have been used for years and traders accustomed to them don’t like change in the form of major updates. Nadex’s mobile apps are top quality. They have all of the functionality of the browser-based desktop trading platform but usability and navigation has been professionally adapted to the small screen format. In terms of design the app version of the trading platform actually looks a lot more contemporary, presumably a result of the apps being built from scratch more recently. 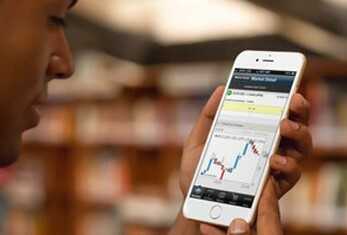 The touch-screen functionality afforded by a smartphone is well utilised by the app’s usability and a feature in areas like the charting section where price charts can be pinched and technical indicators overlaid by touch. The desktop and mobile app platforms are also synched thanks to cloud-based data and traders can open a trade on one platform and then manage it on the other. Nadex offers binary options traders a huge range of instruments to choose from across forex, commodities, indices, the outcome of political and economic events and data releases. Within the forex and indices asset categories a broad range of cryptocurrency-based instruments can also be found. At any one time Nadex traders have a choice of between roughly 2000 and 5000 instruments to trade binary options on. One drawback is that binary options on individual company stocks are the one major asset class not currently available. As far as we are aware, there is not another binary options exchange offering comparable depth of choice. 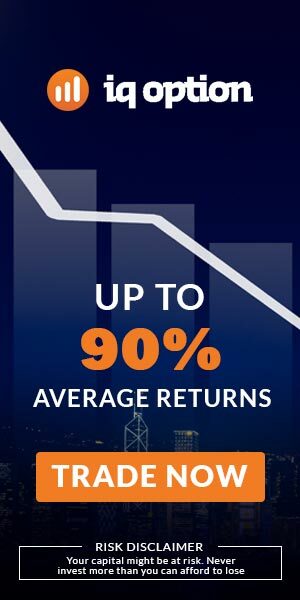 As already covered in some detail, the most notable unique feature of Nadex as a binary options exchange is that it offers DMA pricing on all binary options payouts. This means they are set by the underlying market and not the exchange. The more likely the market thinks the trader is to finish in the money, the lower the payout will be. It also means the trader has full control when choosing the expiry time of options, as long as there is a counter-party willing to take the other side of the option. The trader can also choose to find a buyer to whom to sell their option earlier, exiting the position whenever they want in order to either lock in a profit or limit a loss. 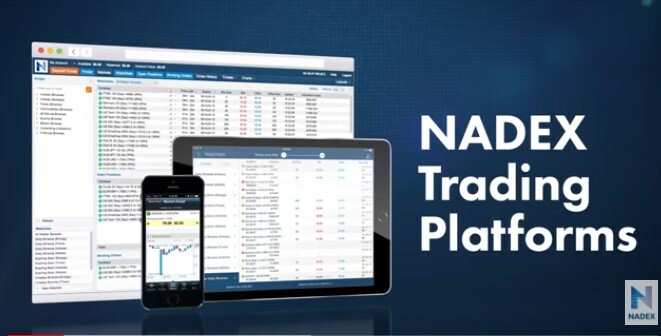 Functionalities that standard market maker binary options trading platforms don’t support, such as depth of market and advanced orders, are also a feature of Nadex’s trading platform, as are real time data and a charting package for technical analysis. Because Nadex is a DMA exchange and not a market maker like other retail-facing binary options brokers, it’s business model is based on charging a $1 commission on each binary options contract taken at entry and exit. This is capped at $50 at both entry and exit of the position for larger trades that exceed 50 contracts. International wire bank transfer withdrawals and returned deposits are also charged at $25 though debit card transfers and bank transfers within the U.S. are not charged. No bonuses are offered as a result of restrictions put in place by Nadex’s regulatory regime. Nadex supports payment processing of both deposits and withdrawals via bank transfer (within the U.S.), wire transfer (international bank transfers) and debit card. Checks are accepted for deposits but not issued for withdrawals. The minimum deposit level is set at $100, though the initial deposit to open a trading account is $250. There is no minimum withdrawal request though fees, as detailed above, do apply depending upon the preferred payment processing channel. Nadex traders have a choice of phone (toll free from the U.S.A) and via email if customer support is required. 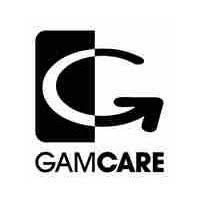 Customer support opening hours are 11:00 ET Sunday through to 17:00 ET Friday. English is the only language customer support is currently provided in. Nadex provides traders with an extensive and professionally put together binary options trading education resource. Video tutorials, e-books, articles and webinars cover topics relevant to all experience levels. 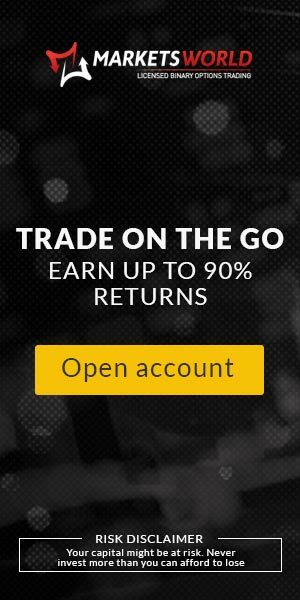 From an experienced trader’s point of view, it is hard to argue there is another retail-facing binary options exchange that offers a more professional and transparent product than Nadex. Because of its richer functionality, the trading platform is slightly more complex than most but that is unavoidable and to the advantage of the trader, offering much greater control. There may be beginners who want the simplest possible trading platform interface that will prefer the more typical platforms of market maker binary options brokers but they should understand that comes at the cost of it being that little bit harder to be profitable as the result of less control. A design update to make the desktop version of the platform look a little more contemporary is something that could be done if nit-picking. The mobile app-version of the trading platform is hard to find fault with and is a top product. With over 2000 tradable instruments, depth of choice is also the greatest on the market despite the fact individual equities are not currently offered. Overall, the most professional binary options exchange currently on the market. No, Nadex is the U.S. unit of IG Group, a FTSE 250 company and the largest retail financial derivatives exchange in the UK. Nadex is regulated as a derivatives exchange in the U.S. and the only U.S.-regulated binary options exchange on the market. 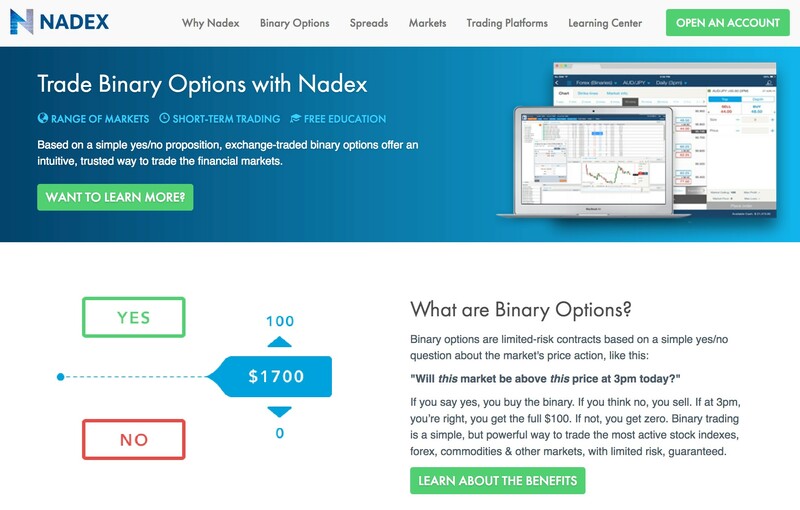 How much does it cost to trade binary options with Nadex? Most binary options brokers are market makers and make money when traders using their platform lose a trade. Nadex is a DMA exchange and only matches trades with another party willing to take the other end. As such, their business model is based on charging a $1 commission on the entry and exit of every binary options contract making up part of a trading position. This is capped at $50 on entry and $50 on exit for larger trades.